Bozhoo! (Hello!) Keepers of the Word is a Native American Outreach Ministry. We are an inter-tribal, non-denominational, organization. Anyone is welcome at Keepers of the Word! We also travel to many different locations to share our ministry and Native American educational programs. Please contact us if you would like to have us visit you. Longest Walk 5 – War on drugs and domestic violence. 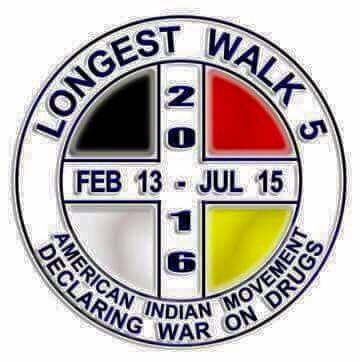 Please help us welcome Dennis Banks and the walkers as they enter South Carolina through Hardeeville on Friday, June 10, 2016. Walkers and runners will be camping in Hardeeville and Walterboro, SC on Friday and Saturday, June 10 & 11, 2016. Keepers of the Word will be providing food and other accommodations for these spiritual warriors, as a small token of appreciation for this very important cause. From Walterboro, they will head up to Grey Court and spend time with the Piedmont American Indian Association Lower Eastern Cherokee Nation, before they head to North Carolina and on up to Washington D.C.